This week, world leaders from France and Germany, meet in Minsk Belarus, with officials from Russia, Ukraine and the separatist groups to discuss a possible peace deal for Ukraine. French President Francois Hollande and German Chancellor Angela Merkel, will meet with the Ukrainian President Petro Poroshenko and Russian President Vladimir Putin, to find ways to end ongoing conflict and a possible ceasefire that innocent civilians in the region desperately need. The peace talk is taking place amid the possibility that the Obama administration might arm Ukraine against the opposition, a move many say will drag the U.S. into a confrontation with Russia and make the peace process reach a dead-end. 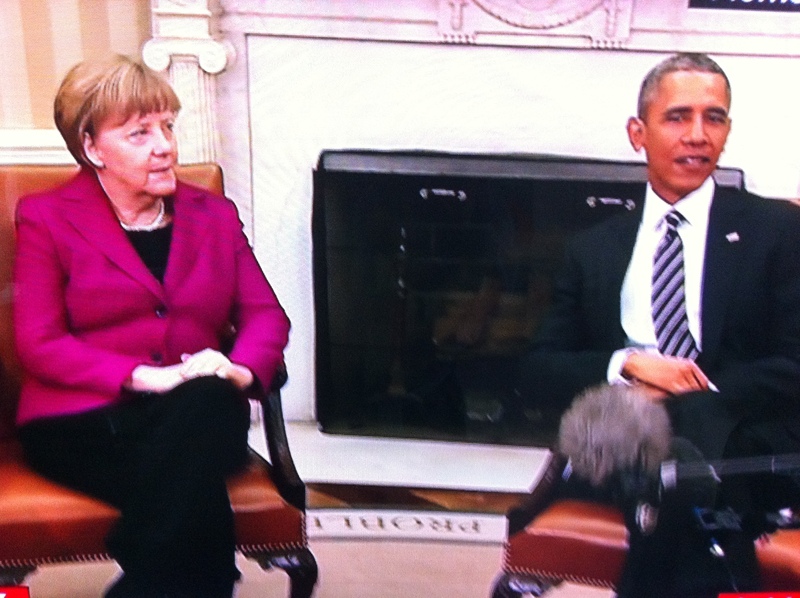 Realizing that such action could worsen the already tense situation, German Chancellor Angela Merkel, met recently with President Obama at the White House, in trying to deescalate the conflict and warn against any U.S. military incursion or support for the Ukrainian government that Moscow could view as a threat. “We continue to pursue a diplomatic solution despite suffering setbacks and we’ll find out in the coming days whether there is a will on all sides for such a solution to be found”, said Merkel. Sounding what many believe, she added that she does not see a military solution to the crisis. Despite targeted sanctions and diplomatic isolation of Russia, Vladimir Putin’s approval ratings continue to rise in what many Russians consider a war against U.S-Western hegemony and quest for dominance. The fact that the Russian economy is suffering and the effect on the Ruble at the lowest ever against the U.S. dollars, has done nothing to turn Russians against Putin’s decision on Ukraine. Now under pressure from some Conservatives in Congress, the U.S. President is considering arming Ukraine with weapons though, President Obama said he is keeping an open mind on the idea. “If in fact diplomacy fails, what I have asked my team to do is to look at all options-what other means can we put in place to change Mr. Putin’s calculus. The possibility of legal defensive weapons is one of those options that has been examined, but I have not made a decision about that yet”, he said. President Obama is accusing Putin of violating the ceasefire agreement reached in September between Moscow and Ukraine, claiming the Russian leader had violated almost everything in the deal. The idea that the U.S. government may choose to arm Ukraine is a miscalculation, considering how Moscow may react to what Putin considers a threat to Russia’s territorial power in the region. Analysts have long warned that flooding Ukraine with American armaments will escalate the conflict and cause Ukraine a terrible defeat. But what could be the results if the U.S. decides to support Ukraine militarily? Any attempt by the Obama administration to arm Ukraine, will close all windows to diplomacy. Russia will stop all negotiations and shift the focus on protecting its territorial integrity by defending itself against what Moscow will now view as an American incursion and interference in the affairs of the region. Even with American armaments, Ukraine is no match for the Russian superior military, which is sure to defeat and devastate Ukraine. For Ukraine to prevail, the U.S. may, need to involve itself in the war, a decision no one in Washington is willing to take. The result would be a weakened Ukraine and one likely to lose more territory than it now possessed. Arming Ukraine will trigger a new cold war between Washington and Moscow. Right now, relations between both nations is at a fallout and any U.S. involvement without proper calculation, will drag America into unwanted arms race with Russia. All deals to end production of nuclear weapons will see an abrupt end due to diminished trust and once again, the world may witness two nuclear powers back in conflict. Despite attacks from various oppositions in Syria, Assad remains in power because of the Russian backing. Since the conflict in Syria began, all efforts to begin a no fly zone over Syria failed because Putin refused to support any resolution at the UN to the effect. With ISIS now threatening global security, many believe the nation is better with Assad in power helping to limit the spread of ISIS all over Syria. Arming Ukraine will make situations worse in the region. Assad will stay in power with Russia’s help, more people will die and finding a diplomatic solution between Assad and the oppositions would be impossible. Current peace agreement between Washington and Tehran is only possible with Russia’s support. The deal over Iran’s nuclear aspiration is a fragile one. Many Republicans in U.S. Congress are calling for more sanctions on Iran because they believe the Iranians cannot be trusted. With the deal still in process, any move to support Ukraine militarily, will diminish Russia’s interests in finding a peaceful solution and make it hard to reach a deal, if Iran decides to renege on its promises. Putin is enraged by ongoing-targeted sanctions on Russia’s economy. The Russian currency is at the lowest in value, the economy has seen a low growth rate and investors are moving assets out of Russia, in fear the economy might collapse under pressure from aggressive sanctions. A military support for Ukraine, will move Russia closer to the rogue state of North Korea. Under pressure from U.S. -Western isolation, Russia will turn a blind eye towards global efforts to end North Korea’s nuclear program. Putin may decide to sell arms to North Korea, to limit damage of sanctions on Russia’s economy and ally with the nuclear rogue state against its enemies. So Russia is a fish bone in the throat of America’s interest ! That Russia will align with North Korea is a fearful imminent global catastrophe and this must not be allowed because the world will be in danger of nuclear weapons. But why hasn’t the author identified any consequence of the roaring conflicts with Africa being aware of the activities of Boko haram and it’s wild escalation to other neighbouring countries like Cameron and Niger. Thanks for your comment Tawawa. I agree a Russia/North Korea alignment would be a catastrophe and a global threat. On Boko Haram, i have written on the issue, which you can find on my site by searching for Boko Haram in the search engine of the page. Boko Haram is a threat but so far, one that is regional unlike Al Qaeda and ISIS. America offered help but with the corrupt nature of the government in Nigeria it is difficult to fight and destroy the group when there is no strong will from the leadership in Nigeria. In fact, it is cynical that with all the resources in Africa and the capability of Nigeria, foreign help is being seek to destroy a group that is nothing more than a local thug. I think African Union should pull together their resources against Boko Haram. The West is willing to help but first Africa must do something about the problem and Nigeria must prove to the rest of the world its military is not corrupt.